Unlike online ER diagram drawing programs that always require expensive monthly or yearly paying, desktop ER diagram program offers lifelong service with one-off payment. Our easy ER diagram desktop software allows you to create ER diagram rapidly, and can work on both PC and Mac system. 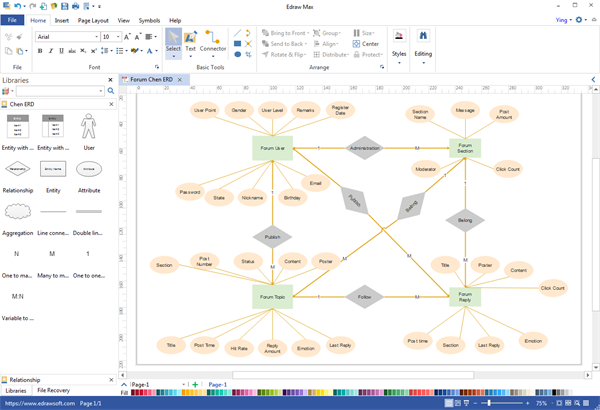 Are you going to use Entity Relationship diagram in your work and want to find a desktop program? Do you need it to work on both Windows and Mac computers? And you you have a limit budget? Try Edraw ER diagram software - a cheap, powerful, cross-platform desktop program. The interface is quite user-friendly as it is similar with Word. Along with the premade symbols and ready-to-use templates, it makes diagrams design and layout easy enough for beginners. When you are done, save your diagrams as local files. Print it or use our one-click export to Microsoft Office. Not happy with PowerPoint when diagramming? Take Edraw. Here are the reasons. A state-of-the-art desktop diagram editor for Windows, Mac OS X and Linux. The easiest software to create quick ER diagrams, pictures etc with drag-and-drop interface. Includes over 10,000 pre-cooked shapes. Some are designed with control points, floating action buttons for easier editing. Thousands of elaborate ER diagram templates and examples for free. Seamless compatibility with MS Office..
Save, print, export and share diagram with no effort. In addition to ER Diagrams, the software can also be used to draw many other types of diagrams. People from all walks of life can benefit from it. Book writers can take advantage of the pre-cooked shapes and images to design quick illustration to assist the understanding of ideas. Teacher can apply the education graphic organizers to engage students and improve teaching quality. Website editors can use infographics generated by Edraw to increase website traffic. Fashion designer can take advantage of the tool to sketch down fashion ideas faster. Businessmen can present their product, do business report and so on visually and more effectively. Here are some entity relationship diagram examples. Click each thumbnail picture to preview the full version in another picture. There you can download the template for free. Double click the shapes to replace content. To change the style, try to use Themes function to modify the font, color and outline at once. Click the employment system entity relationship diagram thumbnail to download the original file. The storage system ER diagram uses entity, relationship and attribute symbols to describe how entities relate to one another in the system. This ER diagram graphically illustrates the pet store system’s entities and the relationships between those entities.